The parliamentary committee of investigation to identify possible corruption risks at the state owned company Port of Tallinn (Tallinna Sadam) has decided to turn to the prosecutor's office to have a criminal investigation opened, as it suspects that incorrect information about the evaluation of the vessel was supplied ahead of making the decision on the purchase of the icebreaker Botnica, informs LETA/BNS. 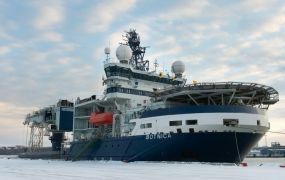 "In the process of its work, the committee of investigation has begun to suspect that the data concerning the evaluation of the icebreaker Botnica, acquired by Port of Tallinn in 2012, was not correct and objective and the icebreaker was bought for a higher price than its actual value," the chairman of committee of investigation, Artur Talvik, said. The deputy chairman of the committee, Andres Anvelt, said the suspicion is based on an analysis of computer files. "The reason for providing incorrect data could be benefit related to the broker's service," he said. The icebreaker was bought for 50 million euros. The Riigikogu committee of investigation to investigate the corruption that occurred in the management of port of Tallinn and the measures necessary to prevent such incidents in the future, established in October 2015, has been tasked with finding out what circumstances favored potential corruption in the management of Port of Tallinn and establish their impact on the management of the company, its functioning and the interests of the state as the owner of the company. The committee will submit the final report on its work to the Riigikogu and the public by May 1, 2016 at the latest. Officers of the Internal Security Service (ISS) detained Port of Tallinn CEO Ain Kaljurand and board member Allan Kiil as suspects in bribe-taking on August 26 last year. They were released at the beginning of January and placed under electronic surveillance. The former Port of Tallinn top executives are suspected of accepting bribes on a large scale over a period of several years at least since 2009. The Public Prosecutor's Office has said the placement of orders for the construction of two new ferries at a shipyard in Gdansk, Poland is a central point of the investigation.